On the 3rd Day of Navratri, MAA DURGA is worshiped as her 3rd form, MAA CHANDRAGHANTA, the one who eradicates all distress negativity and evil spirits. She is married form of Maa Parvati. Maa Chandraghanta appears to mount on a tigress , has a half moon (Chandra) in the shape of a bell (ghanta) on forehead. She has 3 eyes. Goddess Chandraghanta carries Trishul, Gada, Sword and Kamandal in her four left hands and keeps the fifth left hand in Varada Mudra. She carries lotus flower, Arrow, Dhanush and Japa Mala in her four right hands and keeps the fifth right hand in Abhaya Mudra. This form of MAA DURGA with a golden complexion is mesmerising. Lord Shiva praises her for her beauty, charm and grace. She symbolises supreme bliss and knowledge, showers peace and serenity. 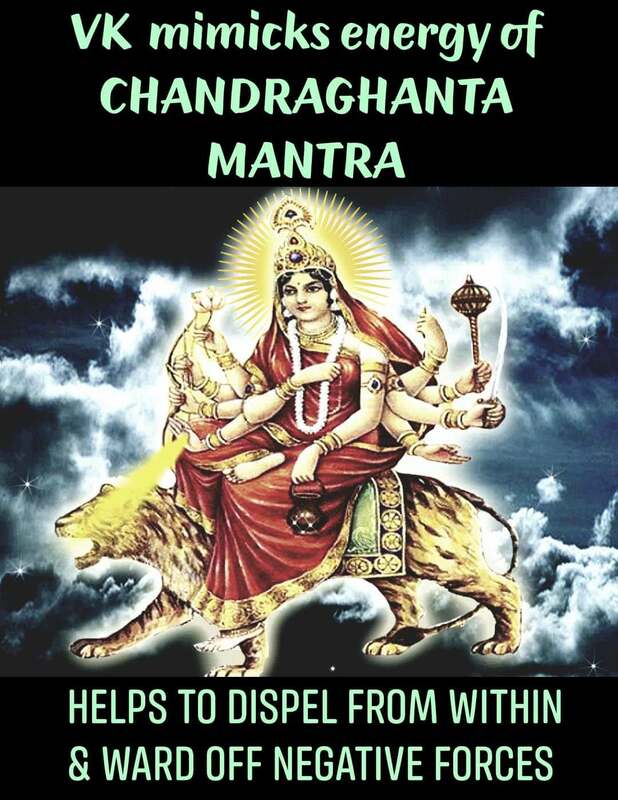 Worshipping Maa Chandraghanta invokes a warrior within and establishes justice. It also brings an aura of divine splendour. Gratitude to Maa Chandraghanta for blessings of bravery and courage peace and prosperity to all. If you love to chant Mantras, you can request VK to help you in chanting and enhance the effects of chanting multifold to you. VK users can also mimick the energy of this mantra with its title. You can request VK with a simple request or charge drinking water with the Title of the Mantra. Thankyou for the wonderful explanation of auspicious navratri and VK tip didi.